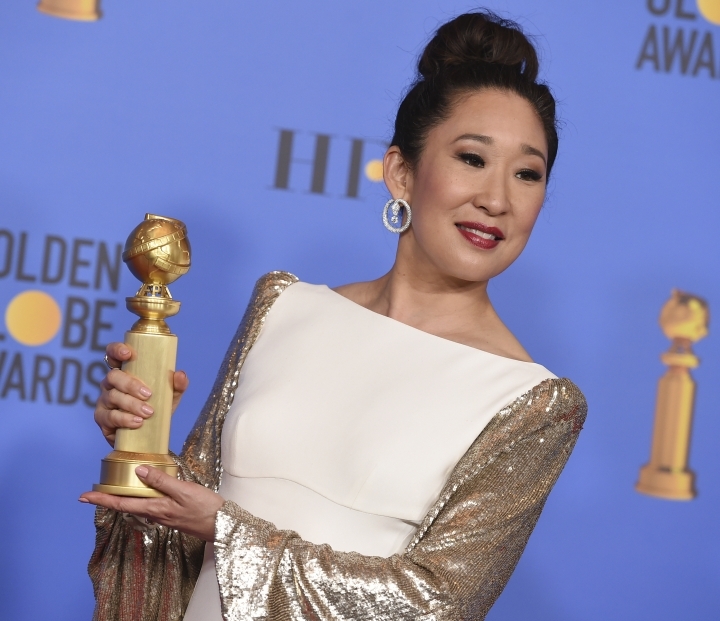 NEW YORK — Regina King sparkled in rose blush by Alberta Ferretti, Nicole Kidman wore a form-fitting liquid oxblood gown by Michael Kors Collection and Sandra Oh wore a couple of standout old Hollywood looks, but the Golden Globes' return to red carpet color after last year's protest in black was led by Lady Gaga in powerhouse periwinkle. The pop star and Ally to Bradley Cooper's Jackson in "A Star is Born" honored an outfit Judy Garland wore when she starred in a 1954 version of the film, with Gaga showing off a more contemporary twist in bulbous sleeves that hit just above the elbows and were attached to a ground-skimming cape. She had a bluish-purple updo to match. 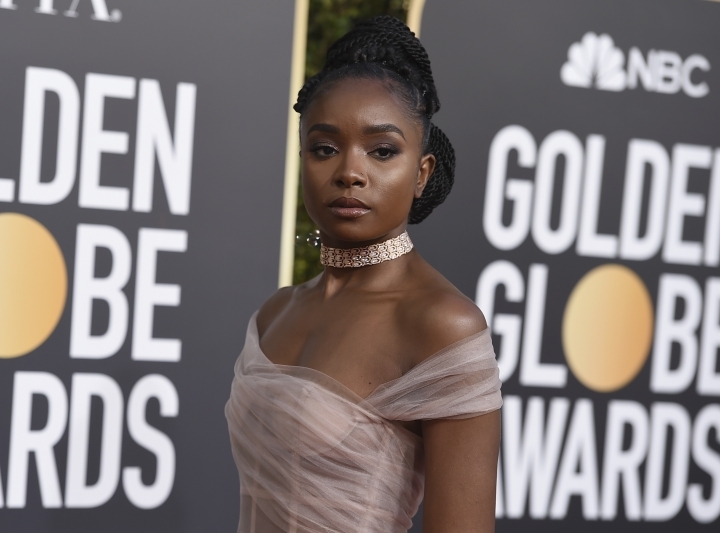 King's strapless dress fit her like a perfect glove and shimmered under the lights as she picked up a statuette for "If Beale Street Could Talk." 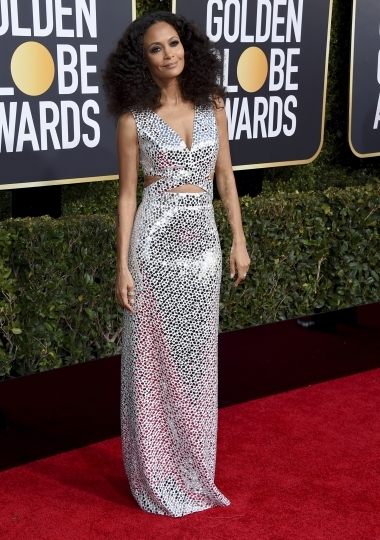 Oh was in white Atelier Versace on the carpet, with a statement pleated piece on one shoulder fit for a 1980s prom. She changed into white with long, full coppery sleeves on stage as she co-hosted Sunday's ceremony with Andy Samberg in Los Angeles. "Lady Gaga won the night in her custom Valentino Haute Couture gown, which I think we all expected given her press run leading up to the movie's release," said Channing Hargrove, a fashion writer for the millennial-focused Refinery29.com. "Cinderella could never!" Gaga wore one of the night's strongest trends around her neck: Big-talking diamond bling. "I Love that Lady Gaga fully embraced the drama of the red carpet," said Rickie De Sole, fashion market and accessories director for W magazine. "Her Tiffany diamond statement necklace was impossible to miss." She added: "Bold diamond necklaces and earrings ruled the red carpet. 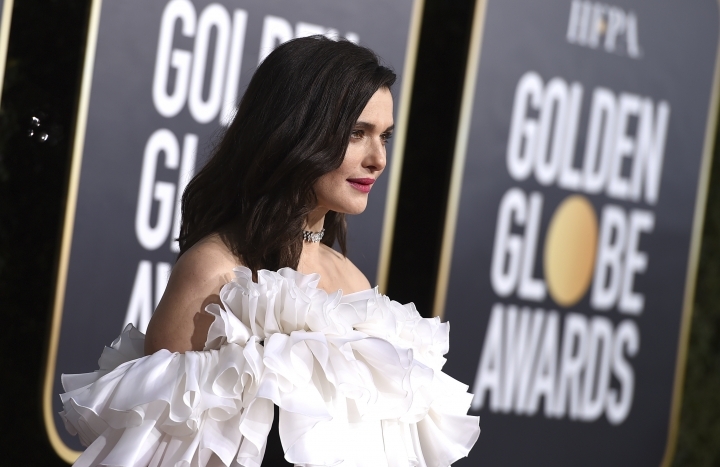 I particularly loved the diamond choker necklaces on Rachel Weisz and KiKi Layne. I love jewelry in the hair and thought Emily Blunt's vintage diamond brooches were the perfect complement to her silver Alexander McQueen dress." Gaga's custom Tiffany & Co. necklace was made with more than 300 diamonds, including a pear-shaped stone of 20 carats that drops at the center. "It's a trend we saw all over the red carpet, from the velvet ribbon bow in Nicole Kidman's hair, front and center on Charlize Theron's black and white gown to more subtle details on Alison Brie and Gemma Chan's dresses," she said. "Julianne Moore's Givenchy dress had a beautiful bow on it — perhaps the best of the bunch." Teen Vogue's fashion features editor, Jessica Andrews, shouted out a couple of the guys. "Instead of the traditional tux, Timothee Chalamet and Cody Fern opted for memorable looks that showed their personality," she said. 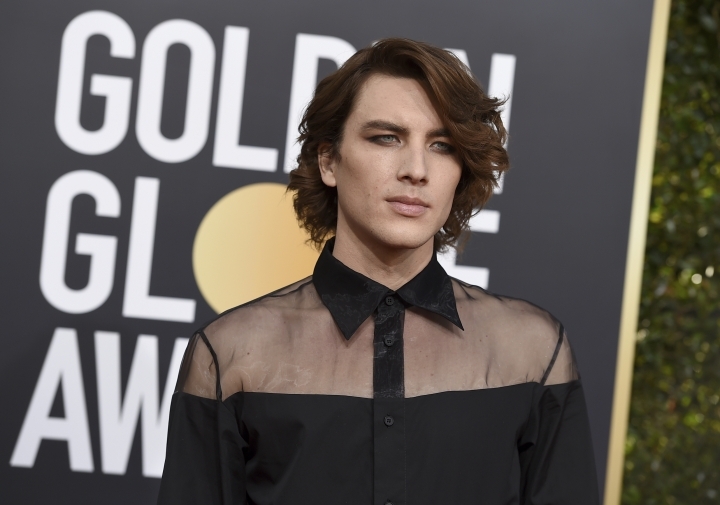 "Timothee in a Louis Vuitton harness and Cody Fern in a black, (partially) sheer top and Margiela heels." 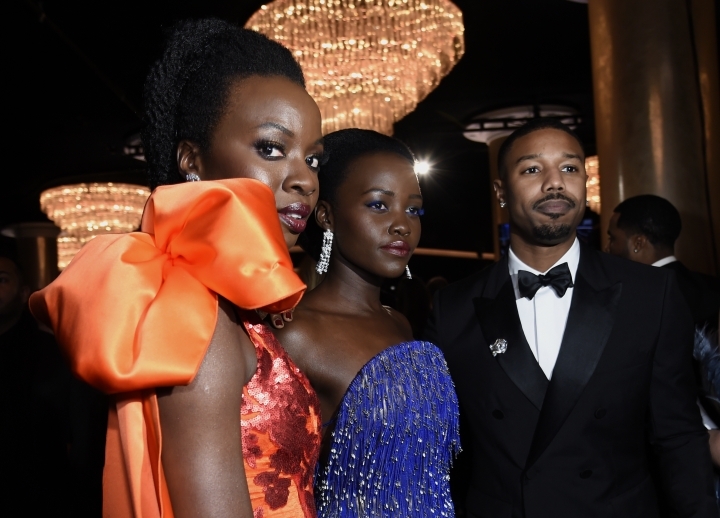 "It was great to see celebrities move away from the metallic gowns of red carpets past and experiment with color. 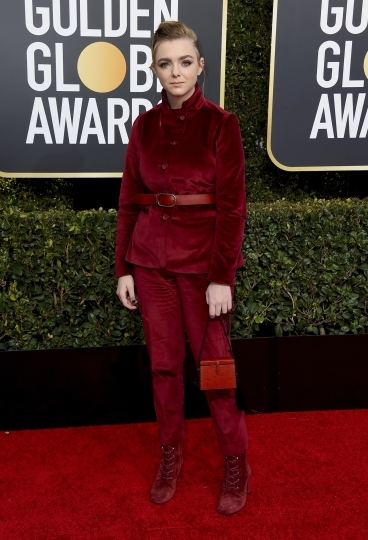 While some ventured toward muted hues like sky blue (Gina Rodriguez in Reem Acra, Dakota Fanning in Armani Prive and Alison Brie in Vera Wang), others went for more powerful tones like red (Lili Reinhart in Khyeli Couture and Elsie Fisher in Kenzo)." 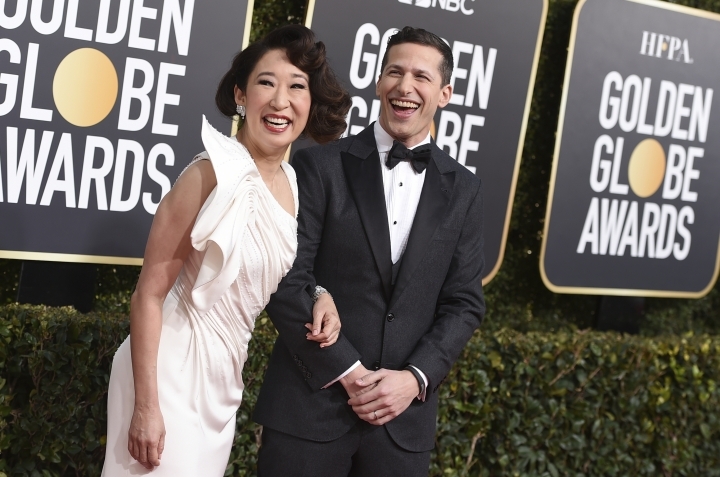 "Sandra Oh's asymmetrical updo was gorgeous," she said. "The style had an old Hollywood glamour to it that is exactly what you'd expect from award season." "Red is a color we generally see on lips, but the way Reinhart covered her eye in a ruby color was unique and modern," she said. She also noted that "neon eye makeup reigned." "Typically at award shows people go for bold lips, but bold eyes are having a moment," she said. Sarah Kinonen, Allure's digital skin-care editor, lauded Camilla Belle's electric teal eye shadow and Gaga's complete look. "I know I'm not alone when I say this, but one of my favorite looks of the night was Lady Gaga's monochromatic blue look. Not just because she looked absolutely gorgeous from head to toe, but because when she goes for a look she really commits. I mean, hello? Did you see her blue hair? Flawless," Kinonen said. Kinonen's No. 1 for beauty: Lucy Boynton. She was splendid in metallic goddess gold, a longer take on a short hemline shown by Celine for spring 2019. The long sleeves were full but cuffed at the wrist, a detail that played nicely with a matching fitted wide waist. The gown's skirt draped into a peekaboo all the way up and her platinum bob was left down and beach wavy. The star also sported double-wing eyeliner with Twiggy-inspired clumpy mascara. "Overall, I LOVED Lucy Boynton's whole beauty look," Kinonen said. "She's a newcomer but really went out. Everything was magic."